Considering the present alternative using human 'donors', switching over to pig donors is a major leap forward. Add in the possibility of using organ constructs as well, then this platform becomes even more useful. In fact it should be possible to store organs this way as well. The point here is to get rid of present practice which is now mostly below the radar and illegal as hell. There will be a perfect system but until then this is a superior idea..
Gene-edited piglets have been cleaned of viruses that might cause disease in humans. There were 33,600 organ transplants last year in the USA, and 116,800 patients on waiting lists and there are around one billion pigs in the world. 100 million pigs are killed each year in the USA for food. A few tens of thousand of pigs grown for their organs would represent just a small fraction of that total, and that they would be used to save human lives. The animals would be anesthetized and killed humanely. Harvard professor George Church founded a company, eGenesis, in hopes of selling the genetically altered pig organs. Eventually, Dr. Church says, the company wants to engineer pigs with organs so compatible with humans that patients will not need to take anti-rejection drugs. Dr. David Cooper, at the University of Alabama at Birmingham, and his colleagues, including Dr. Tector, have used gene editing and cloning to make pigs without the carbohydrates on the surfaces of their organs. They successfully transplanted hearts and kidneys from those pigs into monkeys and baboons. So far, the animals have lived more than a year with no problems, Dr. Tector said. They also gave insulin-producing islet cells from a pig to diabetic monkeys, and the monkeys lived for a year without requiring insulin. In partnership with United Therapeutics, the group has already built a farm for gene-edited pigs. Dr. Church says he, too, is making pigs whose organs lack the carbohydrates, and he wants to combine the two advances so the organs also do not have retroviruses. The Alabama group, though, does not think pig retroviruses are a major concern. CRISPR is a genome-editing tool that can selectively delete, modify or correct a disease-causing abnormality in a specific DNA segment. CRISPR refers to Clustered Regularly Interspaced Short Palindromic Repeats occurring in the genome of certain bacteria. CRISPR technology uses a protein-RNA complex composed of Cas-9, which binds to a guide RNA (gRNA) molecule that has been designed to recognize a particular DNA sequence. The concept of cross-species transplantation, known as xenotransplantation, is the transfer of living cells, tissues or organs from one species to another. Due to the shortage of human organs, xenotransplantation emerged as an alternative potential option and its clinical potential is being explored with new technologies such as CRISPR Cas-9. eGenesis believes that CRISPR technology is a highly disruptive and sophisticated technology that will allow us to address hurdles in xenotransplantation that have previously been insurmountable – and we have the world’s leaders in the field working on doing it safely and effectively. The eGenesis team has been able to produce PERV-free activity through the use of their CRISPR Cas-9 technology. * Investigational New Drug (IND) enabling study – to be conducted at a designated pathogen free facility with a separate herd of pigs. Xenotransplantation is a promising strategy to alleviate the shortage of organs for human transplantation. 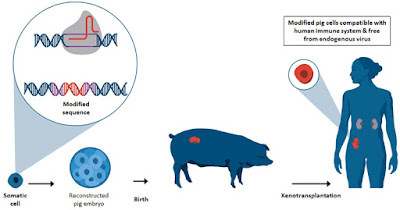 In addition to the concern on pig-to-human immunological compatibility, the risk of cross-species transmission of porcine endogenous retroviruses (PERVs) has impeded the clinical application of this approach. Earlier, we demonstrated the feasibility of inactivating PERV activity in an immortalized pig cell line. Here, we confirmed that PERVs infect human cells, and observed the horizontal transfer of PERVs among human cells. Using CRISPR-Cas9, we inactivated all the PERVs in a porcine primary cell line and generated PERV-inactivated pigs via somatic cell nuclear transfer. Our study highlighted the value of PERV inactivation to prevent cross-species viral transmission and demonstrated the successful production of PERV-inactivated animals to address the safety concern in clinical xenotransplantation.